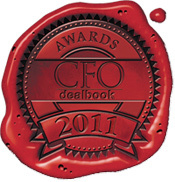 Congratulations to John Stanhope, recognized as this year’s CFO of the Year in Australia at the CFO Dealbook Awards for 2011 , an event sponsored by Australia’s professional accounting body, CPA Australia. The CFO Awards recognize the achievements of the very best in Australian finance over the past 12 months. There are a broad range of categories and specific criteria, with entries judged at a finalist and national winner level. In John’s last year at Telstra it appears he is leaving on the top of his game. He has been instrumental in driving and leading positive customer focused cultural change inside the finance function. An initiative that has since been taken on by other parts of the business and has started to have an impact on customer perceptions of Telstra. Telstra recently refined its efforts further with the creation of the Chief Customer Officer role and increased investments on improving service across the organization. See more of John here in this video interview on the journey towards customer focus from a CFO’s perspective. What legacy will you leave as CFO? This entry was posted in CFOs, customer focus, Customer-Centricity, Telstra, Uncategorized and tagged CFO; customer focus; CFO awards' John Stanhope. Bookmark the permalink.